The Yes Men is Big Finish’s first full-cast outing for the Second Doctor and his companions Polly, Jamie and Ben. Frazer Hines is on double acting duty as Jamie and The Doctor, with Anneke Willis playing Polly and the narrator. But the biggie here is the casting of Elliot Chapman as Ben (originally played on TV by the late Michael Craze). 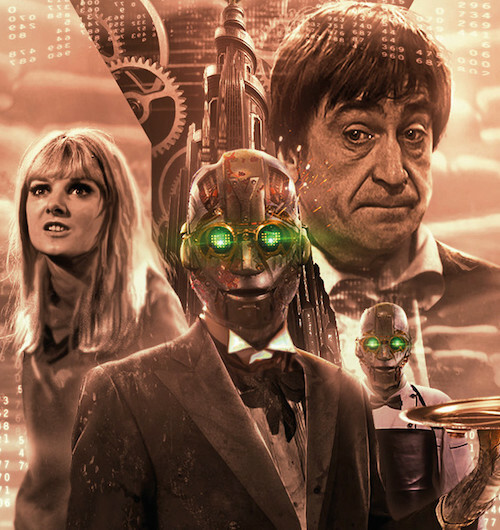 The story starts with The Doctor and chums landing on the Earth colony of New Houston to visit The Doctor’s old friend, Meg Carvossa, who he once helped to defeat an alien invasion before she became President. The problem is that the colony, which has 22 million registered voters, appears to be largely inhabited only by worn out robot servants (the eponymous Yes Men, voiced by Stephen Critchlow), with hardly a human in sight. There’s certainly no sign of Meg Carvossa (Jane Slavin) who appears to have died of cancer, a heart attack, a stroke and a blow to the head. Among other things. In a world viewed from the 1960s, but appearing far more familiar to those of us from the 21st century (flat computers that you operate with your fingers and shops selling an assortment of strange coffees, anyone? ), The Doctor and Polly set off to the Central Intelligence Bank to find out what happened to Meg with the help of obsequious civil servant – the brilliantly named Nesca Bandgate (Timothy Speyer). While The Doctor and Polly are at the CIB, Jamie and Ben encounter the only other human around, Acting President, Harriet Quilp (Lizzie McInnerny) whose casual and callous disregard for Meg’s former robot servant shocks Ben and Jamie into action that leads them to a secret underworld city of broken, rejected robots playing at being human. So, how does Elliot Chapman do in his first turn as Ben? Well, he’s cheeky and very engaging and we’d like to have heard more from him in this adventure. Everyone at Big Finish can safely let out a rather large puff of relief at a job well done. Frazer Hines is great as both The Doctor and Jamie, but the standout performances are delivered by Anneke Wills as Polly and the Narrator. Effortlessly switching between characters, Wills excels in both roles. After the first five minutes, though, who plays who scarcely matters and Simon Guerrier’s well-constructed tale takes over. There are some important moral questions raised about the robot servants as they heartbreakingly recreate the human world in the sewers below it. Are they merely copying what they see above ground or have they really become sentient? And if they really are sentient, what does this mean for the human population they’ve so loyally served? There are also questions about Meg’s morality as we see that her good intentions to save her colony became corrupted along the way until she becomes a woman The Doctor no longer recognises as his old friend. The moral ambiguity comes to a head rather delightfully as the robots, having learned from Jamie and Ben, fight to be heard in a purposefully destructive manner, complete with a Jamie-esque Scottish war cry! In an art-imitating-life scenario, The Yes Men also shows the fate that can await a politician who has become completely out-of-touch with the feelings of their constituents. The Yes Men is a fantastically solid bit of Doctor Who storytelling, where mysteries are solved with good old-fashioned observation and brain power, and problems are overcome with bravery, intelligence and heart. And not a single mention of a sonic you-know-what.